These worksheets are to help support sight word instruction! 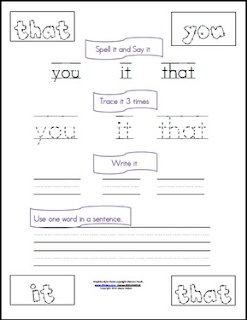 Students will say and spell, trace each word in three different colors, write each word, and at the bottom there is a challenge to use one of the words in a sentence. Also, each word is in a box for students to color! There are three words per page. These work great as morning work or a center activity. The first 25 sight words from Fry's Sight Word list are included. For the first 100 sight words please click on the link below. Check out my Sight Word Binder here! This packet explains how I use the sight word list for individual spelling tests, and how I set up student sight word rings. Click on the green star next to my store logo to find out about sales and new products! Don’t forget to rate this product for TpT credit on future purchases. Go to My Purchases and click on Provide Feedback next to your purchase. Then simply give a quick rating and short comment. I truly value your feedback to make my products even better for you! Graphics used in this product are from www.djinkers.com and my license number is 0414198528.